Christmas brings with it, memories, excitement of seeing loved ones and a sigh of relief at some much needed days off; however, with all of that also comes a sense of anxiety, pressure and stress. The irony is that the selfless act of gift giving becomes a source of holiday stress! Despite what the commercials and retailers lead you to believe, there is a way to approach holiday shopping in an organized fashion. Begin with the end in mind. Take control of the season, own it. What do you want the holidays to look like? Do you want to finish you r shopping early? Or slide into the finish line just before the big guy himself arrives? All of those things are within your control, you just have to create a plan. Shopping is just one part of the puzzle. Although we are focusing on an organized approach to holiday shopping, it is important to note all of the things that are going to require and occupy your time leading up to the day. You would not want to get your shopping list so organized and efficient, but yet forget that you were having company and you needed to clean the house and prepare the guest bedrooms. Identify the must do tasks leading up to the holidays. What is important to you? What are the main things that you want to do, to see or get done ie, visit Aunt Sally in the seniors home, mail Christmas cards, cut down a tree. Get the family involved, incorporate the things that are meaningful to other members of your family. Make a list, check it twice. With all the stress of the holidays, trying to keep shopping lists straight in your head is just an added stressor. Who are you shopping for? Friends, families, teachers? Write it down. Do you have an idea of what you would like to give them. Jot these down too. It may change through the course of your venture, but if there is something on paper, and that eliminates some stress from you. There are many great “products” out there to help organize your shopping lists. 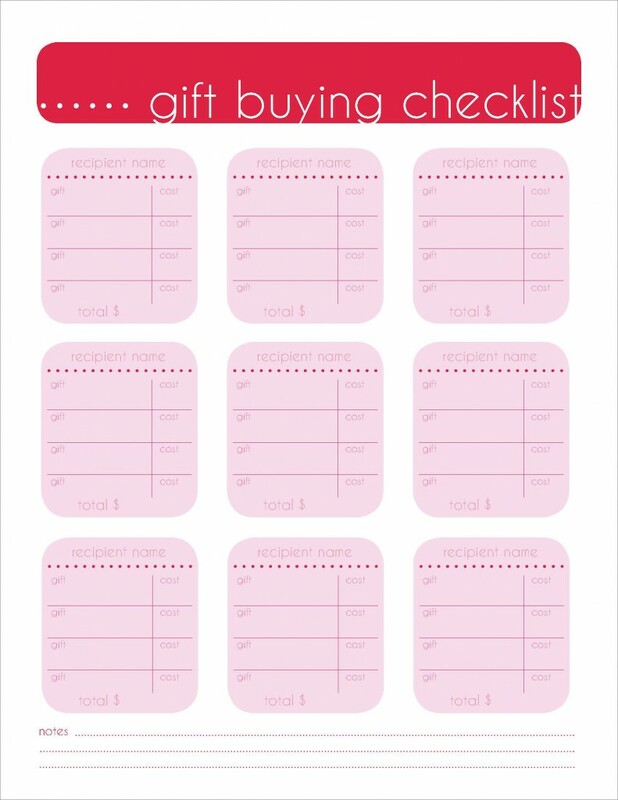 I am fond of this shopping checklist from the Yummy Mummy Club, this is another great one from Life in Yellow. For the more techie types the apps out there are iPhone and Android can access the Gift Plan app, the Fast Mall app, the Amazon Price Checker and others like the The Better Christmas List (by Andrew Grant Productivity). Create a budget and Stick to it! Learnvest financial planning wrote a blog “4 Steps to Budgeting for the Holidays Now“, they say NEVER EVER go into debt at Christmas. One North American survey reported that 45% of respondents dreaded the festive season, the expenses of the season can create stress and depression. By planning and budgeting you have 12 months to acquire the money you need for the holidays. These steps will help you stay on track with your budget for the holidays, but try not to lose focus on the meaning of the holidays. With the press of a button: If you find the hustle and bustle of the malls too much or just can’t seem to find the time, consider shopping online. There are many benefits of shopping online; convenience, a way to compare prices. Another benefit of shopping online, is you can also send gifts directly to relatives and friends easy, no matter where ever they live. The one warning about shopping online, is ensure you find out the cut off dates for shopping to ensure the gifts arrive in time for the holidays. Consider shipping directly to the recipient. Envelope Please. Not sure what to get someone? My suggestion go with the gift of an experience. Unclutterer has generated a list of great experiences to gift to your loved ones. What a great way to give a loved one memories and to prevent the chance they won’t like it and…clutter. Bulk Buy– It is acceptable to give the same thing to a group of people. For example, all of the kids’ teachers can get a Tim Hortons gift card, or all of your book club members can receive a bookmark. This will make shopping easier and gift giving more organized. Consider giving gift cards. This type of gift will help you stay on budget, and keep you organized. Also, you can be sure the recipient will get something he or she really wants. Wrapping– Does this sound familiar? “This year, I won’t be wrapping gifts at midnight on Christmas Eve!” “ Inquire at your local shopping mall if they have a gift wrapping centre. Many times it is in support of a local charity. Although there is a cost involved, usually donation, think of the time saved, the perfect wrapping job and the charity you just supported. If you are a lover of wrapping, lessen the wrapping burden and wrap as the presented come in. How to make it easier for next year? Are you doing all these things but still find the practice of Christmas shopping mayham? Then don’t wait until the last minute. Don’t even wait until the season. Ramp your shopping up at the start of the year and do a little bit at a time. Start picking up things for next year when they go on sale after the Christmas season, look for great sales all year and build your Christmas list. “Christmas is not a time nor a season, but a state of mind.